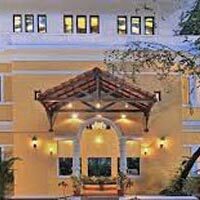 Walk to Goa beaches from hotel's convenient location At the Phoenix Park Inn Resort in Goa, the hotel's elegant, tropical decor sets the tone for a relaxing escape to paradise. 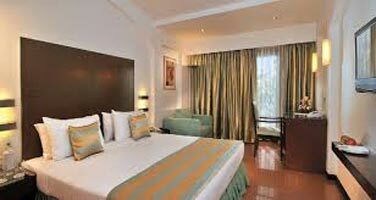 Bordered with swaying palms and ocean breezes, Candolim Beach is only a 500-metre walk from the hotel's gorgeous lobby. Perfect for visitors on holiday, the hotel is just a short buggy ride from the famous Sea N Sand Shack. Choose from 128 lavishly appointed hotel rooms, many of which overlook the lushly landscaped pool area. Amenities also include Wireless High-speed Internet, two exceptional on-site restaurants, a poolside bar and barbecue, and a flexible meeting space for up to 150 guests. Getting into and out of Goa is easy thanks to the hotel's location 45 minutes from Dabolim Airport and 30 minutes from the railway station. Reserve one of the stylish Standard or Premium Rooms, or upgrade to a Deluxe Room and enjoy added amenities like a complimentary fruit platter and drinks at Chapora. Treat yourself to a tasty meal at one of the on-site restaurants, Chapora and Sal, or sip on a refreshing cocktail by the sparkling pool. 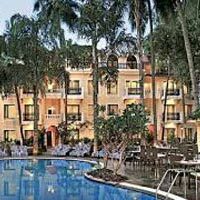 Soak up the sun during your holiday in Goa at the resort's outdoor pool, surrounded by stunning tropical gardens. Stay connected with Wireless High-speed Internet access, offered throughout the property. Choose the hotel's event space for intimate conferences with 10 guests or larger, catered events with up to 150. Daily Breakfast & Dinner buffet/fixed menu basis . Complimentary arrival & departure transfers from the airport (dabolim)/ railway station (Thivim ) in AC vehicle. Rs.2500/- per couple extra from madgaon railway station. Two bottles of mineral water to be replenished daily. Free usage of swimming pool and fitness center. Free wi-fi usage in the hotel. Extra adult / child rates are for the package duration. 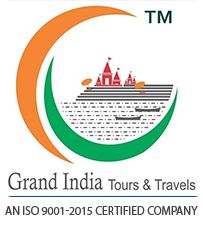 For two night stay 80% rate will be applicable. All rates are subject to change without prior notice.Any Air or train fare. Monument fee / Camera fee. Holiday Highlight happy hours at Chapora daily from 5 pm to 7 pm at our restaurant "SAL". 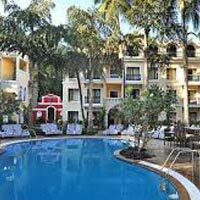 (buy 1 get 1 free) Description Walk to Goa beaches from hotel's convenient location At the Phoenix Park Inn Resort in Goa, the hotel's elegant, tropical decor sets the tone for a relaxing escape to paradise. 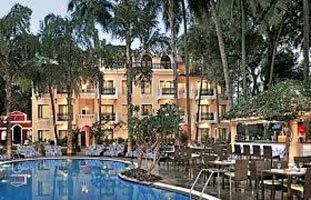 Bordered with swaying palms and ocean breezes, Candolim Beach is only a 500-metre walk from the hotel's gorgeous lobby. Perfect for visitors on holiday, the hotel is just a short buggy ride from the famous Sea N Sand Shack. Choose from 128 lavishly appointed hotel rooms, many of which overlook the lushly landscaped pool area. Amenities also include Wireless High-speed Internet, two exceptional on-site restaurants, a poolside bar and barbecue, and a flexible meeting space for up to 150 guests. Getting into and out of Goa is easy thanks to the hotel's location 45 minutes from Dabolim Airport and 30 minutes from the railway station. 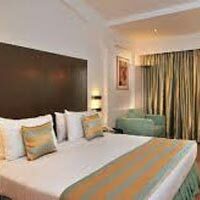 Reserve one of the stylish Standard or Premium Rooms, or upgrade to a Deluxe Room and enjoy added amenities like a complimentary fruit platter and drinks at Chapora. Treat yourself to a tasty meal at one of the on-site restaurants, Chapora and Sal, or sip on a refreshing cocktail by the sparkling pool. 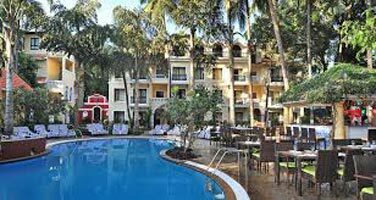 Soak up the sun during your holiday in Goa at the resort's outdoor pool, surrounded by stunning tropical gardens. Stay connected with Wireless High-speed Internet access, offered throughout the property. Choose the hotel's event space for intimate conferences with 10 guests or larger, catered events with up to 150. For travel between April 1, 2016 and Sept. 30, 2016.